This new stuff called "Spray Klaf." The claim was that it was Mei Klaf in spray form. I have been using Mei Klaf(usually with an Eida Chareidit Hekhsher) for years. I have never seen Mei Klaf do this. The letters litterally are not davuk to the klaf. I can erase them with a rubber eraser, and break them by running my fingernail over them. Here is a picture of a Mezzuzah that I wrote with "Spray Klaf" treated Klaf. The damage done occurred from simply rolling the Mezzuzah. I don't use Mei klaf,Spray klaf etc. so I can't comment on the performance (though I never liked the idea). 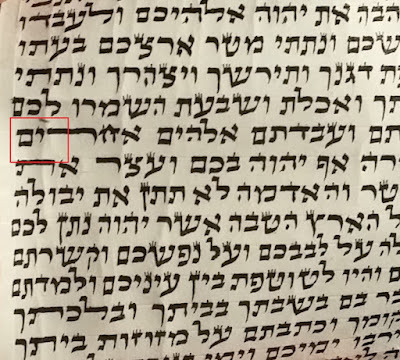 What I would like to know is which Mei klaf has a hechser from the "Eida"? I never saw such a thing (and I saw a lot). Is it printed on the bottle or just "mouth to ear" (which is not worth much in this case)? It is called פאר the hekhsher is printed on the larger bottles. It is also the only Mei Klaf sold in Safrut stores under the hashgacha of the Eidah HaChareidit(at least when the Teuda at the store says all things in the store are under the their hashgacha). May I ask which "safrut stores" are under the Hechsher of the "Eidah"? Check the Chareidi Phonebook, they are listed there. I think I already said it once. I will say it again. There was a time when I wanted to develop a better kind of מי קלף . I asked Rabbi Avraham Zvi Wosner and he told me that writing on מי קלף is like writing on plastic. So, I gave up the idea. Now, in this picture we see that the ink does not adhere to the klaf. The ink sits on the plastic and does not adhere to it. So, rubbing it removes it easily. This provides experimental verification to what HaRav Wosner said. There was a time when I thought of developing a better "Mei klaf". I asked Rabbi Wosner and he told me that writing on mei-klaf is like writing on plastic. Big חשש of חציצה. So I dropped the idea. I had assumed you were talking about Rav Shmuel HaLevi Wosner, a renowned posek from the Eidah. This other Rav Wosner I haven't heard of. However I would be interested in seeing a written psak from him, especially as what you are saying Mei Klaf does, is not chemichally/physically possible. Spray Klaf acts in a way that I have never seen Mei Klaf act. I have taken it to the heads of Yad Rafael and Mishmeret Sofrim who agree that it is different. It essentially makes the Klaf Mashuach. Which, m'ikar hadin isn't a problem, the only reason we don't use it is because of the degredation that it causes to the writing. HaRav Avraham Zvi Wosner is the grandson of HaRav Shmuel HaLevi Wosner. He lives in Monsey, NY. Various types of mei-klaf are made from plastic dissolved in a solvent. When the solvent evaporates, the plastic stays behind. One way to see the plastic is to apply it to glass. Let the solvent evaporate, and then, you can see the dry plastic and scratch it with your fingernail. There is another kind of material which does not contain plastic. I don't know if it is used for klaf. This second type of material would prevent anything from sticking to the klaf. Using it would not be a problem of חציצה but would cause a bigger problem - the ink will easily fall off. The kosher or non-kosher status of any kind of mei-klaf is not in the hands of the sofer and not in the hands of the sofer's Rav. It is only in the hands of the customer. Just like kosher food. If I don't accept the kashrut of a certain food, It is irrelevant to me that someone else does accept it. (e.g. 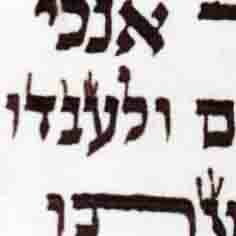 קטניות on פסח ) Therefore, I believe, that the customer MUST KNOW that the STAM he buys was written on klaf treated with mei-klaf. Just like an אשכנזי must know that a certain food labeled as kosher-for-Pessach contains קטניות . I don't see how Mei Klaf would be a bigger problem of chatzitzah then chalk or mashuach. On the subject of Mashuach there is not much to add. We all know what it is. Chalk powder is not חציצה because the ink goes around the chalk particles and reaches the fibers of the klaf, so the ink can bond to the klaf itself. A plastic layer prevents the ink from reaching the klaf fibers. 1) Mashuach is permitted though(and was done for a time l'chatchila) though not recomended. 2) Any plastic(or other particles) left by the Mei Klaf are not different than chalk, in that they do not form an impermeable barrier(in fact I have a megillah in which the dyu penetrated the full thickness of the klaf despite two treatments of mei klaf and a treatment of chalk). Quote: "dissovling plastic in a solvent permanently alters the plastic. It will not form an impermeable layer of plastic again later." Sorry, but this is simply not true. Nail polish for women is plastic dissolved in a solvent. Any woman who uses nail polish knows that it forms a continuous layer on her finger nails, and it is a חציצה when she goes to the Mikveh. Mei-klaf coats each fiber with a layer of plastic around it. A small amount of mei-klaf will coat and surround the fibers and still leave empty space between the coated fibers. So the ink can penetrate into the empty space, touching only the plastic, without touching the klaf fibers. On each fiber individually, the plastic prevents the ink from touching the fiber. Nail polish for women is plastic dissolved in a solvent. Any woman who uses nail polish knows that it forms a continuous layer on her finger nails, and it is a חציצה when she goes to the Mikveh. Not true. Nail polish is a lacquer applied to human finger or toe nails to decorate and protect the nail plate. Today's nail polish is a refined version similar to the paint on vehicles. However, its formula has been revised repeatedly in order to prevent t the cracking or flaking that occurs with the natural movement of the nail. Some chemicals in nail polish have various degrees of toxicity. Lacquer is a somewhat imprecise term for a clear or colored paint that dries by solvent evaporation. Nail polish today is a refined version of the paint on vehicles. Most nail polishes are made of nitrocellulose dissolved in a solvent (e.g. butyl acetate or ethyl acetate) and either left clear or colored with various pigments. Basic components include: film forming agents (silver halide), resins and plasticizers, solvents, and coloring agents. Adhesive polymers (e.g. tosylamide-formaldehyde resin) ensure that the nitrocellulose adheres to the nail's surface. Plasticizers (e.g. camphor) are chemicals that link between polymer chains, spacing them to make the film sufficiently flexible after drying. Nitrocellulose is nitrated cellulose, also known as flash powder. It is extremely explosive in its natural state, but one disolved in acetate or another similar solvent becomes quite stable(hence your wife's fingernails have never exploded or combusted from hard contact). Ethanate solvents typically permanently alter the things that they disolve. So unless you have lab reports saying that Mei Klaf is somehow the one solution in that family of solvent/polymer solutions, your point doesn't make sense. By the way, dust, dirt, including chalk dust under a teacher's fingernails is also considered a chatzitza for the purpose of mikvah. So your analogy breaks down on both counts. There is a lot more to learn about nail polish than what the Wikipedia article offers. But, this is not a discussion of how to make nail polish. By the way, nitrocellulose is also a plastic material. What's important here is that mei-klaf is plastic dissolved in a solvent. When the solvent dries, what's left behind is a layer of plastic. By the way, nitrocellulose is also a plastic material. No its not. It is a nitrate not a polymer. It can be plasticized by the addition of various agents but it is not a polymer. Typically the addition of a solvent to a polymer will break it down it's polymer chain into its monomers. In essence you would have microscopic particles that are essentially dust, but you will not get an actual polymer again without a plasticizing agent. "Plastic" and "polymer" are not synonyms. Not all plastics are polymers and not all polymers are plastics. 1915 Plastics: DuPont entered the plastics industry as an outlet for excess nitrocellulose and gradually expanded into a leading producer of diverse plastic products. Beginning in the 1870s, researchers discovered that nitrocellulose, when combined with certain solvents, yielded a solid solution that could be molded and hardened for commercial use. This plastic immediately found markets as a substitute for ivory and metal. Polystyrene dissolves in acetone. When the acetone evaporates, we get back the solid polystyrene, not the liquid styrene monomer. (I just tried it). If you don't like the term "plastic" you can replace it with "something". Mei-klaf is "something" dissolved in a solvent. When the solvent dries, it leaves behind a layer of "something" which coats the klaf fibers. While leaving the microscopic space between the fibers open? Again you are talking things that are physical impossibilities. But let us assume for a second that you are correct in your assertion. So we are talking what, one maybe two molecules thick? To that you are going to apply a highly acidic ink, that causes flash corrosion on metal, and corrodes even stainless steel in under a week(I know I tried it). You somehow think that a single molecule of a soluable polymer will stand up to that? Thank you for bringing DuPont into this. I was Bar Mitzvah in the Synagogue that the DuPonts built for their Jewish employees in Penns Grove, NJ. My maternal grandfather is executive VP of the Deepwater Point Dupont research facility and my step-father is a senior researcher in their polymers department(he helped develop kevlar). In 1915 DuPont bought Pyraline, which is a Culloid. Which is a nitrocellulose blended with camphor(a plasticizing agent) by means of a solvent. there is no point in continuing the discussion. Really it is Ok to simply say you don't know how polymers work. As far as "Kosherizing" something. Mei Klaf is made by, and under the hashgacha of reputable Rabbanim in the stam world. It's use as last I checked, was endorsed by the Vaad Mishmeret Stam, Yad Rafael, and Vaad Mishmeret Sofrim. I've spoken with Rav Mordechai Alfasi: His response was that the assertion that it is not kosher for use is absurd. Rav Ovadia Yosef: Simply said he didn't have time to deal with such foolishness. The Yeriat Shlomo writes in his sefer to use Mei Klaf. Rav Shternbuch of the Eida said there were no problems with it. He has set up a meeting for me with Rav Wosner(the famous one). Despite it's wide use and various Choshuv Rabbanim giving it support, you have yet to produce a single actual psak saying that it is not kosher. Please produce a written psak to counter the various hechsherim if nothing else. Speaking of relying on imagination you have made up stories of how polymers work, and what a chatzitzah is or is not. Can anyone post an actual teshuva or statement from the eidah about this? What would be the difference between mashuach and mei klaf? The Hechsher given to klaf Mashuach is based on the coating being added for beauty, and arguing that anything added for beauty is not חציצה . Women's nail polish is certainly added for beauty. So, why are they required to remove it before going to the Mikveh? I read another Hechsher to klaf Mashuach, I don't remember the source. There was a time when good ink was not available. The available ink did not catch and hold on the klaf. 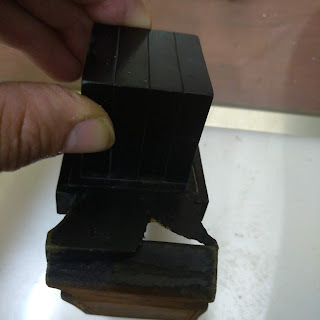 Having no other choice, they discovered that coating the klaf helps the ink catch and stay. This Hechsher is similar to a person lost in the desert without kosher food. For him it is allowed to eat food which would be non-kosher for everyone else. Because of his distress, the non-kosher food becomes kosher for him. So, whatever he ate in the desert is considered kosher. Once he reaches a place where Jews can give him universally kosher food, the "desert" food becomes non-kosher. Likewise, once we have good ink that does not require coating of the klaf, the coating of new klaf becomes non-kosher. It becomes non-kosher even though it was kosher in the past because of the distress. If you really want to go with Chatzitzah and compare it to Hilchot Niddah, I will gladly go down that path with you. 3) The persom must be makpid on it. The Rabbis then made a Gezairah with regard to mikvah that even if it only covers a minority but he is makpid on it, or if it covers a majority but he is not makpid on it we will consider it as a chatzitzah in so that we do not transgress. This is how the Shulchan Arukh YD 198. Now if a woman who is not makpid on the state of her nail polish were to tovel, while l'chatchila she would need to remove the nail polish and tovel again(because it is the nature of women to be makpid on it)since it only constitutes a m'd'rabbanan we learn in siman 200 that after the fact the teveila stands as kosher. 1) It is visible. Mei Klaf is invisible... so that doesn't work. 2) It covers the majority. There is no way of knowing, and most sofrim I know only apply it to problem spots. But even if totally applied, there isn't enough disolved anything for it to be able to say that it truly coats the majority. 3) We are makpid on the state of it. I don't know anyone who is worried that the mei klaf will always be there and look nice(especially since it is invisible). So it meets none of the requirements for an actual chatzitzah. Right - the heter of mashuach is because it beautifies the writing. Mei klaf doesn't beautify the writing? Re nail polish - the heter of beautification is of the mitzva (eg the Ketiva, sukkot etc). The nail polish doesn't beautify the tevila. There is a book on ibud batim/tefillin... something Eliyahu. Unfortunately it is no longer in print. However he talks about it there. Though from my recollection his advice is to only apply it to batim that have needed to be repaired because of rounding. To help ensure that they don't round again. R' Tzadok: You opened this post by telling us about the "mei-klaf in spray form" and how the ink rubs off easily. 1. What do YOU think is the reason the ink rubs off so easily? 2. Do you think it is kosher to use such a material, not only from the point of view of חציצה but mainly from the point of view of חשש הונאה or לפני עיור לא תתן מכשול towards the customers? What would happen if after rolling this Mezuzah you or the customer would not open it right away to inspect it? 3. Do you know how many customers of other sofrim are using tfillin and mezuzot written on this or similar stuff without knowing what happened to the writing inside? 4. Did you, or are you going to, show this mezuzah to the Rabbanim who approved mei-klaf? Actually I opened this post by saying that it is not as advertised, and thus to warn others who may mistakenly think that they are getting the good old mei klaf in a form that is easier to apply. I have no idea why it does what it does. I haven't had a chemical analysis done on it. I have never seen this with mei klaf, nor have any of the Rabbanim I have consulted, some who have been writing for 50yrs and swear by mei klaf. M'ikar hadin yes, as it is no different from Mashuach. However it would be preferable not to. Again the hilchot of chatzitzah do not apply. but mainly from the point of view of חשש הונאה or לפני עיור לא תתן מכשול towards the customers? What would happen if after rolling this Mezuzah you or the customer would not open it right away to inspect it? Then the owner of the mezzuzah would be over b'shogeig and the sofer would be responsible to replace the mezzuzah. For Chashash of the latter one should obviously not use spray klaf. Which is why I made this post, and why Yad Rafael and Mishmeret Sofrim are publicizing the problems with it to their certified sofrim. Mei Klaf has been around for a long time, and no sofer I know has ever had a problem with it. This stuff is relatively new(in the past four or five months). There may be a few... Don't know. Hopefully as the problem becomes publicized, sofrim will do what they need to do and recall and check/replace defective items. Again the problem isn't with Mei Klaf, it is with Spray Klaf. Am I going to contact the Rabbinic oversight of Spray Klaf? No. I am going to contact(or have already done) those Rabbanim/Poskim who I have a kesher with. Thus Yad Rafael and Mishmeret Sofrim are publicizing that Spray Klaf is a problem. I have a suggestion: Since you have strong family connections at DuPont, how about sending them a few samples of different types of mei-klaf, and the spray-klaf, for materials analysis? Then we will know what is in them. This analysis is relatively easy to do. I used to have the analysis tools in my materials-research lab. Now, that I am retired, I no longer have access to them. I have no doubt that your family members have the necessary tools. what about super glue that all batim machers use in the making of the batim? what about the thin spray coat that is applied to retzuos so that it feels smoother and doesn't make you full of crumbs when its new? So, מי-קלף can cause the same problem as spray-klaf. The only difference being that it was discovered a year later. I wander if מי-קלף and spray-klaf are the same material at different concentrations?